Click on any link to the left to visit our bike pages, event schedule, services and more!! We are experiencing price increases in material, European vendor prices, and the exchange rate. Please be aware of these changes!!! If you have any questions, please call us for current pricing! A performance mod for your trials machine which increases torque throughout the entire RPM range, giving your engine smoother response, more grunt, and better top end. Combine with our cylinder head mod for the ultimate trials engine! Your cylinder head is re-machined to a new combustion chamber shape and compression ratio. This gives you more torque throughout the entire RPM range. Your stock reed cage is modified for more flow. Combined with our Boyesen Reeds, this mod gives a broader, smoother power band. Don't forget your spacer kit! Use the above mods with any and all of our other engine modifications for the Ultimate Trials Engine! NEW!!! B&J -manufactured aluminum front fender brackets, available in your choice of finish. Made from high-quality aluminum, has a significant weight difference over the steel chromed version. For use with our after-market fenders. Manufactured of an extremely pliable, flexible plastic that absorbs impact easily. Dress up your vintage trialer! Manufactured on-site out of quality aluminum. Lasts much longer than the original plastic skid pan and is a much better form of protection! Includes all mounting hardware. Save your stock seat and tank! Install our tank and seat combo; sleek good looks and it doesn't dent as easily....Includes tank, seat, decals and petcock assembly. Uses your stock gas cap, or we can provide a new one! We highly recommend you coat your new tank with our tank sealant. This protects the tank from the additives in the US fuel supply, which do not necessarily like fiberglass. We can provide the sealant. Replacement seat has plastic seat pan. Finished in black. Fits 1976 model ONLY as is; will fit other twin-shock models when used with our universal fenders; bracket manufacture required. "Block" Yamaha tank decals; fit the after-market seat/tank unit. Manufactured of high-quality, hard plastic impervious to gasoline and chemicals. Renthal Handlebars, 5" / 5.5" / 6"
High quality alloy braced 7/8" trials handle bars. Gun metal gray. Cross bar pad not included. High-strength 2014-T6 aerospace alloy rated at 70,000 psi ultimate strength. 1/4" cut guides for precise modivication. Knurled clutch side for secure grip hold. Shot-peened finish to increase fatigue life. Cold-forged crossbar with stainless hardware. Includes crossbar pad. Footpeg lowering kit for the TY250! Does wonders for stance & balance. The lowering kits are bolt-on, but do require machining. Comes complete with all hardware and mounting instructions. Weld these manufactured-on-site extensions to your stock pegs for a wider area for your feet, more comfort, and better control (pegs not included). 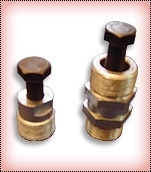 Send us your stock pegs and we will weld the extensions on for an additional $30.00. Replace your stock shift lever with our folding-tip lever and have one less broken lever to worry about! Alloy adjustable clutch lever. Forged construction in anodized silver finish. Features 3 cable tension adjusting points; softens pull. We use it as a brake lever, too! 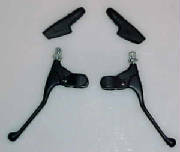 Inexpensive replacement for your stock lever assemblies. Available in black or polished finish. Not for use with hydraulic clutch or brake systems. Available singly or in pairs. Aluminum levers; very forgiving and bend rather than break. Fit standard 7/8" bars. Available separately or in a pair. Slow- (black tube) or fast- (white tube) trials throttle assembly. Aluminum tube throttle assembly (fast turn). All cables manufactured on-site, assembled with a seven-seven strand of aircraft-grade inner cable inside a flat-wound housing with a nylon inner sheath for maximum strength and flexibility. All throttle cables require a Domino throttle assembly. Front brake cables may require your stock adjuster. Call for more info. Throttle Cables do not include throttle assembly. Used to inject lubricant into the cable housing. Clamps over the housing and wire, allowing an aerosol can to be connected. Once the lube runs out the far end, the cable is lubricated. Rear sprockets. We stock 53T but can get the size you want! High-quality pins, bushings and rollers for maximum durability. Comes with one extra master link. Kit comes complete with a flat rear aluminum sprocket (machined to accept a spacer), rear sprocket spacer, front sprocket, and a heavy-duty chain. We recommend 44/10 gearing ratio, but we can provide the gearing you prefer. The chain comes with one exta master link. Comes complete with spring, arm, pad, and hardware. We recommend Silkolene Chain Lube. B&J's electronic ignition for the TY250 offers an advance curve that allows the engine to produce more torque and higher RPM, which in turn offers better traction and helps you achieve a lower score. All this, without points! What more could you ask? Includes on-site machined backing plate and all ignition parts, mounting hardware, NGK spark plug, a high-quality waterproof spark plug cap, installation instructions and a timing chart. The best one we've found! Waterproof, genuine NGK "L"-style cap. Includes piston, clips, rings and wrist pin. After-market Wiseco piston in bore sizes 70mm-72mm (.50mm increments). Let us measure your cylinder to ensure proper sizing! bearing, small end bearing and thrust washers. Gasket set includes: Head, base, clutch cover, mag cover, oil pump cover, exhaust, and reed gaskets. countershaft, and left & right crank seals. When you have to remove your TY's oil pump, B&J's cover and gasket is a must-have! When you're through refreshing the engine and ready to put it back together, dress it up with our stainless steel case bolts! Everything you need in one easy package. WES exhaust system paired with a Sammy Miller exhaust pipe as installed on The Guru's tricked-out TY250. Alloy exhaust system saves 4lb over the stock system. Modular design for easy cleaning and repacking. This design also makes individual component replacement possible. High-quality alloy rear silencer; re-packable. Designed to replace original front pipe. Stainless steel construction. Made of tough dura-flex hi-temp fiberglass designed specifically for exhaust use. 1"x5"x10-1/2". Refresh your tired stock carb with a new Mikuni carburetor kit! Pre-jetted, ready to bolt on, includes all you need to make your TY run like a dream: new carb, Domino throttle assembly (your choice fast or slow), and a new throttle cable. Upgrade your TY's performance level with our performance kit. Includes the same carb/ cable/throttle as our regular kit but also comes with our oil pump cover and gasket, Renthal grips, PCW air filter, Boyesen reeds and our reed spacer kit. Boyesen reeds offer maximum performance. The top reed opens at lower RPMs allowing for more air and fuel flow for better throttle response. The bottom reed opens at higher RPMs for maximum flow. Spacer kit sold separately. Our reed spacer kit will give you more torque when paired with Boyesen reeds. Kit does not include reeds. Black fuel line, compatible with a wide range of high performance additives. Extremely flexible, resists kinking. Manufactured on-site of high-quality foam. Fits your stock cage. Don't forget your air filter oil! Silkolene foam filter oil is a high-technology coating treatment for all foam filtrs. It contains polymeric additives which provide a hyper-tacky surface to resist sand, dust and water, but not air flow. It applies extra thin to penetrate and then sets highly-tacky. Maxima FFT foam filter oil is a waterproof filter protection against dirt and fine dust. Its synthetic formula does not restrict air flow, plug filter cells, or migrate off the filter. Increases the octane rating of your fuel while cleaning the carburetor internals, enhancing combustion efficiency, and combating pinging and pre-ignition. For all gas-powered engines. We proudly offer both Silkolene and Maxima pre-mix, gear oil, fork oil and anything else you need! Call for pricing! New! Finally, the long-awaited replacement fork caps for TY250 twin-shockers! Beautifully CNC-machined from billet aluminum. No longer do you need your Volkswagen oil-drain plug wrench to remove your fork caps. New caps are machined to be removed and replaced with a standard 23mm wrench. What an idea! B&J's custom progressively-wound fork springs will replace the tired and sacked-out OEM springs. Don't forget the fork oil and our damper rod mod. Manufactured to fit your bike! Custom Falcon gas trials shocks built on-site, re-buildable, re-chargeable. Truly customized to your rider weight, ability, and bike. Spring rates from 40 lb to 110 lb. Even a young rider benefits from the right shocks! Generic gas trials shocks with progressively-wound springs, 40 lb - 60 lb rate. Non-rebuildable, non-rechargeable. Silkolene fork oil is an advanced formula front suspension fluid that reduces wear, resists corrosion and oxidation. In light, medium, and interrmediate weights. Maxima fork oil has a high viscosity of 190+ which provides uniform fork action over a wide temperatur range. Special additives control anti-foaming, rust and corrosion. In light, medium and intermediate weights. Stainless steel pre-packaged or custom spoke sets. Please clean your engine and/or components prior to shipping. If we have to clean the engine and/or components prior to repair or modification, there will be an additional $65/hr charge.